This time of year I love to spend some of my precious free time (you know those two minutes every night before crashing in the bed) skimming Pinterest. Oh, how addictive that world can be. 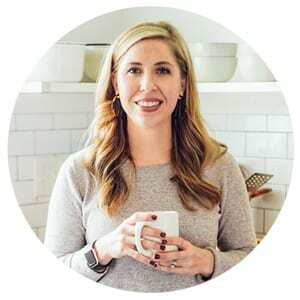 Seriously, the moment I open the big world of Pinterest I am immediately sucked in. The gorgeous photos, the countless crafts, sewing projects, and children’s masterpieces. I just get so giddy inside. It’s a dangerous, wonderful world. In those compulsive moments of Pinterest I find myself magically forgetting that I can’t sew, I can barely work a hot glue gun, and I barely have enough time in the day to quietly use the ladies room, let alone plan millions of super cute DIY crafts and projects. A few weeks ago I could just feel that fall itch. It’s as though September 22nd hits and by pure instinct I want all things fall. I broke out the pumpkin puree, put up the scarecrows, planted the fall garden, and searched high and low for fun fall activities for my two littles. Of course, I turned to Pinterest for the latter. I spent all night scouring ideas. I pinned, I liked, I shared. There were lots “ewww” and “awww” moments. So many cute ideas. But there was one big issue: multiple step masterpieces just don’t work around here. At least not just yet. Right now, we are in a simple stage of life. Fully embracing simplicity. Not only in food, but life in general, even in the crafty hands-on department. You know what I’ve found in all this simplifying? Kids actually dig simplicity. They really do! A cardboard box? Oh, what a perfect house, mom! A huge pile of dirt? What a perfect city to build, climb on, and roll trucks through. Simple wax crayons and paper? What masterpieces can be created! Children love and embrace simplicity which allows them to explore, create, and imagine. Exactly as young minds and hands should be doing. After all the searching I decided on playdough. 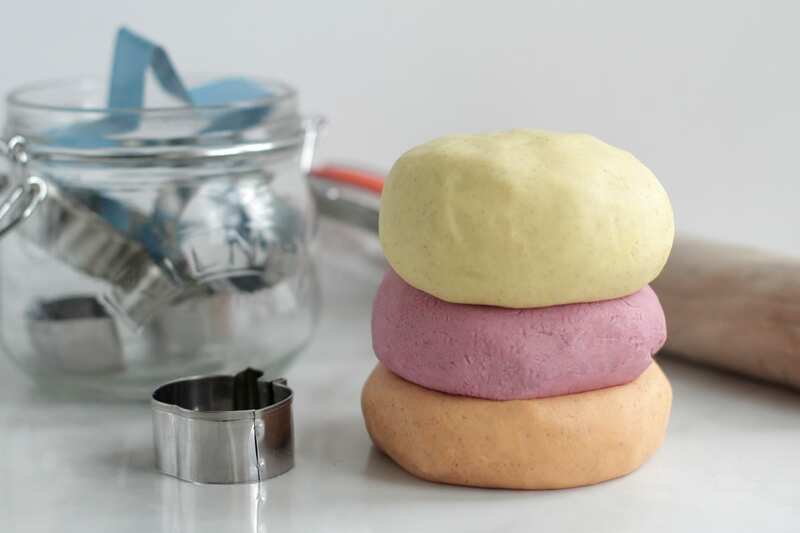 What could be simpler than good old fashioned playdough? I shudder at the amount of chemicals and dyes in store-bought playdough so I decided to make our own. 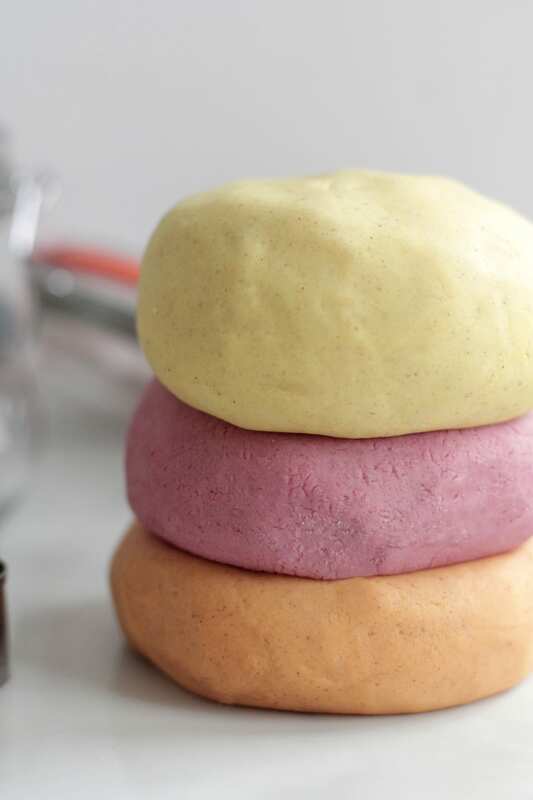 Homemade playdough is made with just a few key ingredients and takes just minutes to whip up. The result are amazing. 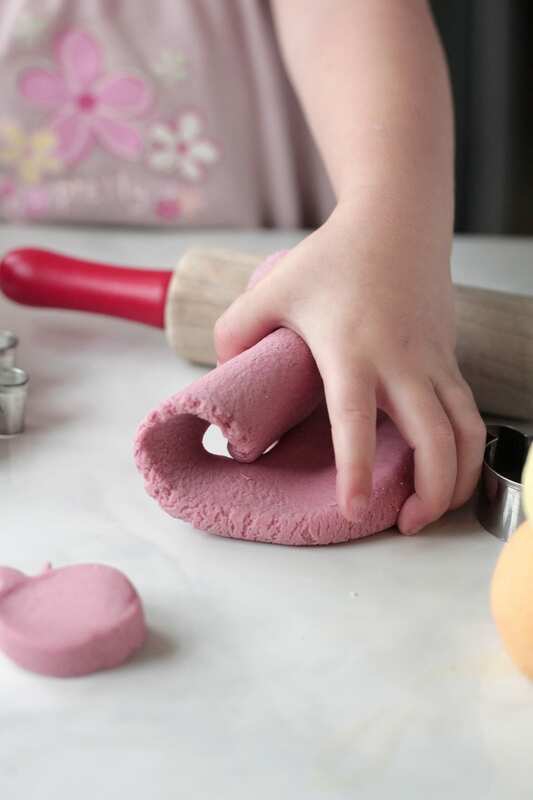 Playdough that’s safe for little hands and tummies (just think of the yucky ingredients in the store-bought stuff) that lasts for weeks and can be played with over and over again. With fall in mind we added pumpkin spice and cinnamon flavor to create the ultimate fall sensory experience. Playdough that delights the senses. To add beauty we used various spices and homemade juices to add the perfect fall color touch. Beautiful shades of natural crisp apple red, pumpkin orange, the changing leaves of yellow and green, and toasty brown. My children have happily been playing with this naturally-dyed sensory playdough for weeks reminding me that simplicity is often the key to success even with children. 1 1/2 cups flour white, wheat, spelt, your choice! 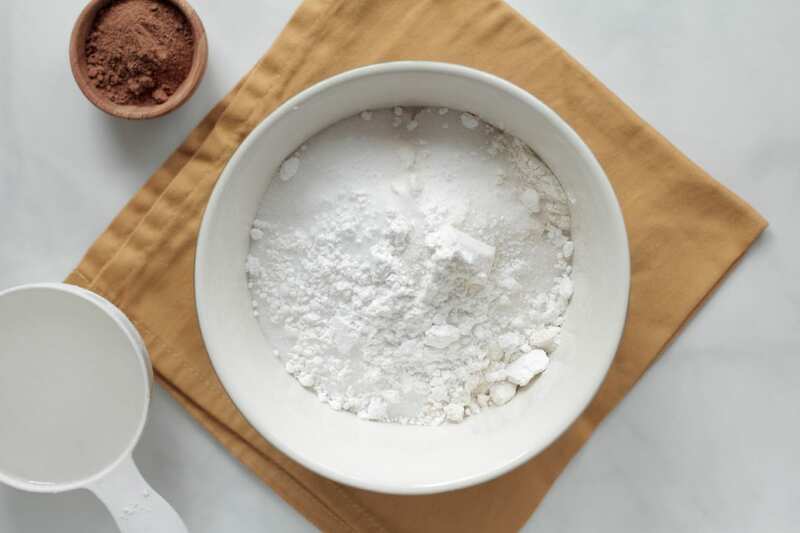 In a medium-sized mixing bowl, add flour, salt, cream of tartar, and pumpkin pie spice. Heat 1 cup of water. Add the water to flour mixture. Now, mix! Mix, mix, mix. 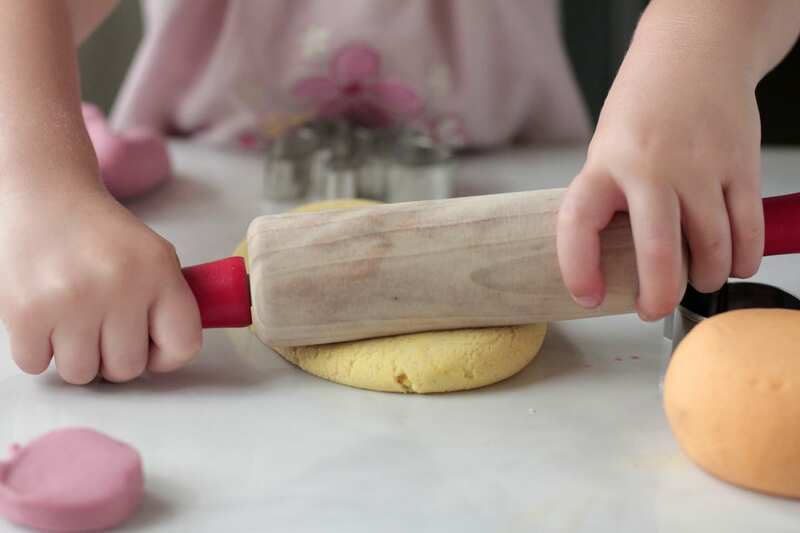 Once the dough is firm enough to handle, scoop the dough with your hands and knead until you have a firm playdough. 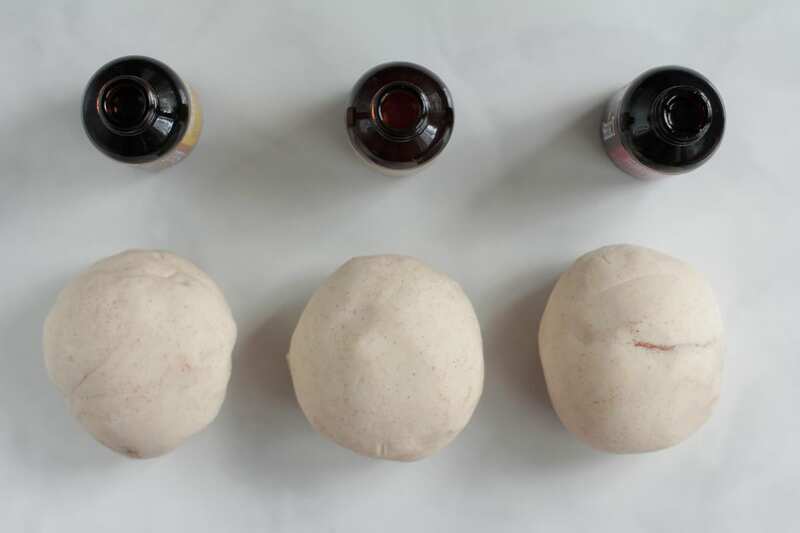 Divide into three small balls and add the food coloring of choice. Knead the dye into the dough, adding more dye to achieve the color desired. 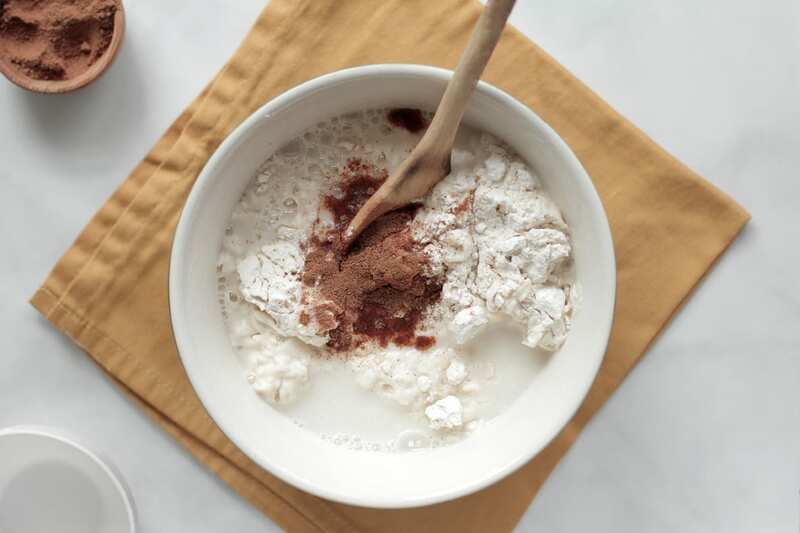 During play time provide extra pumpkin pie spice or fall spices in small bowls (cinnamon, allspice, ground cloves) for children to sprinkle on their dough and experience fall. *Check your local natural food store for dyes made from food, such as the brand listed above. If you’re using natural spices (or juice) for dye add the spice (or juice) during the mixing of the wet and dry ingredients. 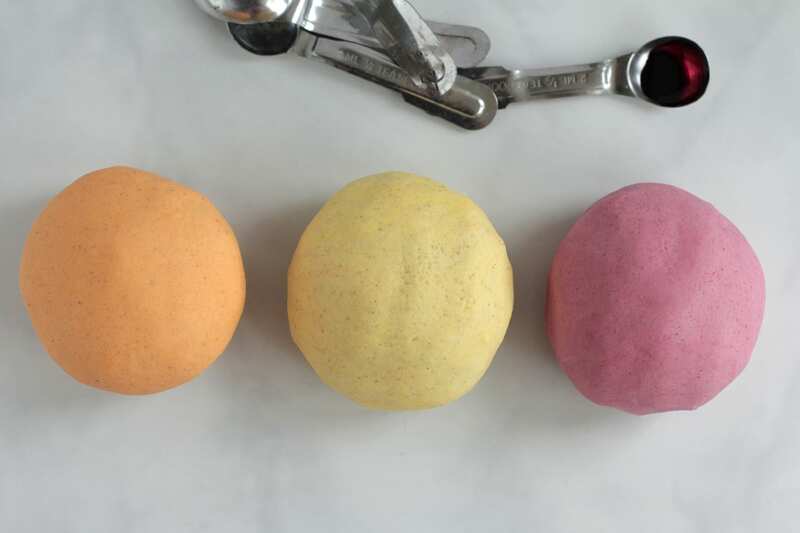 Homemade playdough will last several weeks (if using fresh dye made from juice in your juicer) or months if using store-bought natural dyes. 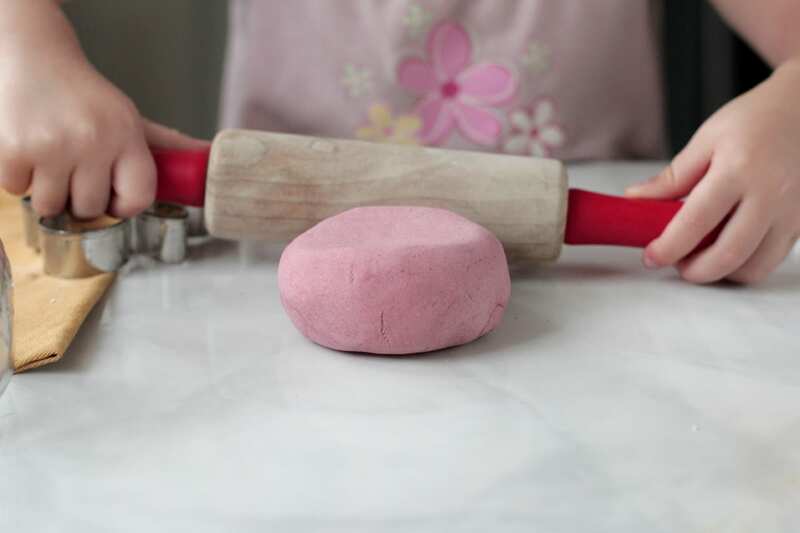 If your playdough begins to dry out, you can easily revive it by adding oil and kneading. Good as new. Can this be made with a gluten free flour? I haven’t tried it with a gluten free flour mix, however, I believe it should work well. Wonderful. I’d love to hear how it turns out with the gluten free version. Where is the oil added? It’s in the ingredients list but I don’t see it in the process. Also, the ingredients list has 2 drops of cinnamon flavoring, but then at the bottom, it says to pour a teaspoon in…? I think I will use a teaspoon of actual cinnamon. Add the oil with the wet ingredients (water). You can use 1-2 teaspoons of cinnamon flavoring (which is an oil) if you desire a stronger scent along with the dry cinnamon spice. How much playdough does this yield? I’m not really sure how to measure the amount of the final product, however, I would say one ball could fill 3-4 regular size playdough size containers you would purchase at the store. Hi Emily, I’m sorry it’s sticky. The only thing I can think of is the difference in flour density and texture we may be using. I would try to add more flour, knead it in, and see if that takes care of the stickiness. 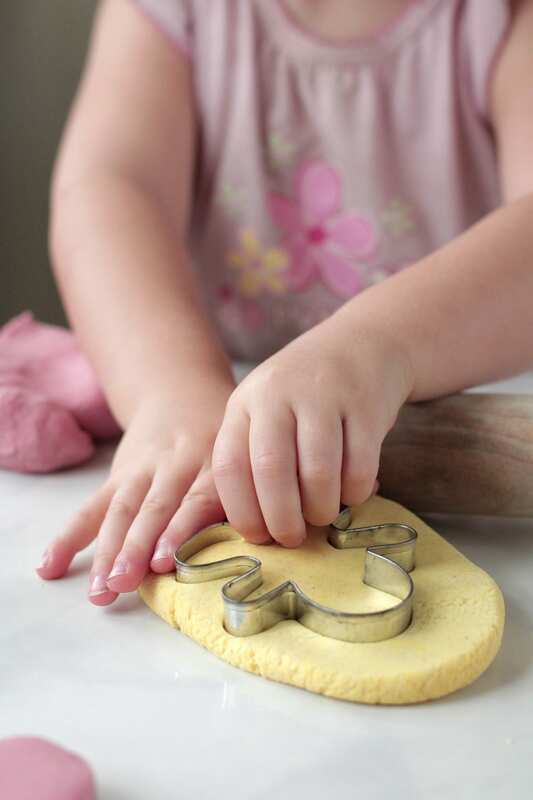 What a wonderful idea to add spices to the playdough so it’s aroma is as enjoyable as playing with it! You’re such a genius! I wish my boys were still little so we could make this together. Maybe I’ll just have to do it anyway and see if I can get these preteens to re-live the past. LOL! Are you aware that there have been several incidences reported of children being admitted to hospital in renal failure from eating home-made playdough because of the high concentration of salt, please make parents aware that they shouldn’t let their children eat this playdough, it is great for sensory play but they still need supervision whilst playing with it. I’ve used this recipe for years without incident but only because of vigilent supervision. Hey Libby, Thanks for addressing that issue. That’s unfortunate that a few parents have let their children be alone for long enough to eat that much playdough. The real Hasbro Play-doh is made primarily of flour and salt too. It’s not like eating *any* play dough is safe, regardless if it’s home made or store bought. I think there are lots of incidences reported of children being admitted to the hospital from falling on sidewalks too–even when their parents were watching! I imagine doctors see all kinds of things in a day, but renal failure from home made play doh has to be a fairly rare one. Driving in a car (and it’s me driving!) is more dangerous. Life is full of risks, it’s good to have some common sense and not sweat the small stuff. Usually the dough is so salty that most kids don’t want to eat a bucket of the stuff. Thanks for sharing, Jennifer. Enjoy the playdough! Thank you! 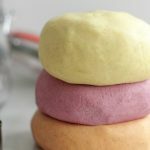 My kids have been begging for playdough, and I was looking for a new recipe! You’re welcome, Heather! My kids love making this recipe and it’s so easy!!! Enjoy. Could you mix it in a stand mixer using the paddle attachment?